From digital startups to behemoths of industry, Chicago fosters corporate facility growth better than any other metro area in the U.S. The Chicago metropolitan area registered 373 corporate facility investment deals in 2013, more than any other metro area in the U.S.
Banks’ pure love of the game manifested itself in everything he did. He didn’t consider baseball to be work. He considered it life. The same could be said for Chicago. The metropolitan area of 9.56 million people may go by a lot of nicknames — Chicagoland, the Windy City, Second City, Chi-Town, City of the Big Shoulders — but one thing virtually everyone agrees upon is that Chicago is a city that’s alive. From diehard Cubs fans who have waited 106 years since the team last celebrated a World Series championship, to a thriving business community that produces a high-tech startup every 24 hours, Chicago breathes with an energy that is unique to the Midwest capital on the banks of Lake Michigan. Whether it’s Mike Ditka staring down opponents with his resolute scowl on the sidelines of Bears’ games in the 1980s, or Gogo setting up its in-flight Internet service headquarters in new digs downtown, Chicago is always on the move and being talked about. Add Site Selection to the growing list of media talking about Chicago. By securing more corporate facility investment projects than any other metro area in the U.S. last year, Chicago took home the trophy as the Top Metro in America. With 373 facility deals, Illinois’ largest city easily outdistanced its closest competition — second-place Houston with 255 projects and third-place Dallas-Fort Worth with 178. Atlanta (164) and Detroit (129) rounded out the top five. Jeff Malehorn, president and CEO of World Business Chicago, says it is easy to see why the Second City perennially finishes first in Site Selection’s facilities race. Chicago connects people, he says. A case in point is Chicago’s emergence as a data center hub for the Midwest. Last year, the Chicago area won significant data center facility investments from Equinix, Latisys and others, as well as significant IT infrastructure investments from Google, Gogo, Groupon, Paylocity and Huron Consulting. And in February, Hyatt Hotels moved 60 IT jobs downtown from the suburbs. The 50,000-sq.-ft. (4,645-sq.-m.) incubator for digital startups, located in Chicago’s famed Merchandise Mart, is churning out new digital firms at a startling rate. Malehorn says Chicago produces one new digital startup every single day. Chicago, in short, has found its happy place, bringing to mind another classic quote of Ernie Banks: “You must try to generate happiness within yourself,” he said. “If you aren’t happy in one place, chances are you won’t be happy anyplace.” Banks never left Chicago during his 19-year career in Major League Baseball. Judging from the comments of those doing business in Chicago these days, he’s going to have plenty of company. already knew: Omaha is a hot market. Omaha may not be the biggest city in America, but during January no city in the country generated more news coverage than Nebraska’s largest metropolitan area. Media attention exploded when fans of the National Football League discovered that Denver Broncos All-Pro quarterback Peyton Manning was rather fond of shouting “Omaha!” multiple times at the line of scrimmage before certain plays. During a playoff victory over the San Diego Chargers on Jan. 12, Manning yelled out “Omaha!” a whopping 44 times. Fortunately for Brown and his colleagues at the chamber, Manning isn’t the only public figure leading the charge to bring more attention to Omaha. During 2013, the metro area of 900,000 people led all comparably sized communities in America by landing 48 corporate facility investment projects. Beating out Allentown, Pa., and Baton Rouge, La., which tied for second place with 46 facility projects each, Omaha secured its first-place ranking in the tier-two population category (all U.S. metros of between 200,000 and 1 million people). On top of that, Creighton is turning the college basketball world upside down with a breakthrough season, as even more fans of the new Big East Conference flock to Omaha to watch the ninth-ranked Bluejays take on Villanova, Georgetown, Providence, Xavier and other perennial basketball powers. TD Ameritrade Park in Omaha hosts the College World Series each summer. The biggest wins that Brown is celebrating, however, are those occurring off the court — corporate facility investments that are bringing jobs and capital to the Omaha area. Topping the list of those investments in 2013 was a $700-million office expansion by Travelers Insurance in Omaha. Other major Omaha projects included a $108-million manufacturing expansion by Airlight Plastics Co., creating 117 new jobs; a $58-million warehouse expansion by U.S. Cold Storage, adding 100 jobs; and a $54-million expansion by Lozier Corp., generating 105 jobs. More big deals came from Yahoo Inc., Kellogg USA, MLB Advanced Media, Rotella’s Italian Bakery and Northstar Wind Towers. The largest jobs announcement came from Nelnet Inc., which committed to hiring 300 workers at its consumer lending operation in Omaha. One of the most active industries in the Omaha MSA is the data center sector. Google, Yahoo and Fidelity have all announced major expansions in the bi-state region. After this string of success, what will Omaha do for an encore? Brown says the one thing Omaha won’t do is rest on its laurels. Brown says the plan is to funnel more support to launching and growing startups in the region and increasing the regional GDP. Pennsylvania metro ties with two Iowa communities atop 3rd-tier MSAs. Visitors to the Sioux City Art Center aren’t the only ones looking up in the Siouxland metro area these days. What do Altoona, Pa., Dubuque, Iowa, and Sioux City, Iowa-Neb.-S.D., all have in common? In 2013, they formed the first-ever three-way tie for Top Metropolitan Area in the tier-three population category, which includes all US MSAs of less than 200,000 people. 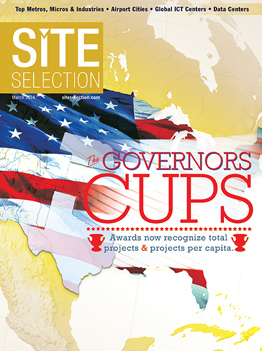 Recording 14 corporate facility investment projects each, these three small metros beat out Odessa, Texas, which had 12 projects, and Gainesville, Ga., which registered 11. Also ranking in the top 10 were Decatur, Ala., Bowling Green, Ky., and Battle Creek, Mich., with nine each, followed by Sheboygan, Wis., and Auburn-Opelika, Ala., with eight. Chris McGowan, president of The Siouxland Initiative, is no stranger to the top of the standings. This marks Sioux City’s fourth win and sixth appearance in the top three. Altoona, Pa., tied with Sioux City and Dubuque, Iowa, as the No. 1 top metro in the tier-three population category. Photo courtesy of Altoona Blair County Development Corp.
A surging agribusiness economy has given a huge boost to many employers in the tri-state region of Iowa, Nebraska and South Dakota along the Missouri River. Two firms — Wells Enterprises and Bomgaars — have done exceptionally well. Wells Enterprises is expanding by $20 million and 65,000 sq. ft. (6,038 sq. m.) in Le Mars, Iowa, which thanks to Wells’ Blue Bunny brand is now known as the “Ice Cream Capital of the World.” Bomgaars, meanwhile, is investing $17 million into a new 150,000-sq.-ft. (13,935-sq.-m.) distribution warehouse that creates 64 new jobs. Coming off its 100-year anniversary, Wells operates the world’s largest ice cream plant in Le Mars, at just over 1 million sq. ft. (92,900 sq. m.). Bomgaars — a Sioux City-based retailer that operates 66 farm and garden supply stores and employs 1,500 people across the Midwest — is also growing. Its president, Roger Bomgaars, says that several factors make it easy for his company to keep expanding in Sioux City, its home base since 1952. The Port of Dubuque serves as one of the main transportation and logistics assets in the entire eastern Iowa region. Photo courtesy of Greater Dubuque Development Corp.
Across the state in Dubuque, companies as diverse as Hormel Foods and Rainbow Oil are leading an economic resurgence in eastern Iowa. The result was a $36-million capital investment that adds 91 jobs in meat products processing in Dubuque, which earned accolades as a top 10 best-performing small city in America from the Milken Institute in 2013. Not to be outdone, Altoona, Pa., climbed to the top of the corporate facility project charts in 2013 with its strongest showing in the history of the Conway New Plant Database. Value Drug Co. is investing $30 million into 190,000 sq. ft. (17,651 sq. m.) that will be used for corporate offices and distribution space. The facility is slated to open this month.